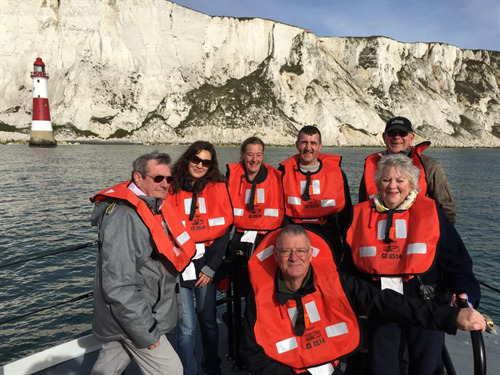 Following the previous year’s success, Seaford Town Council recently organised another trip on the Newhaven Lifeboat for the Councillors in a bid to raise money for the Mayor’s Charities and to donate £100 to the RNLI Newhaven. On Sunday 22nd October 2015, Councillors and staff along with their families boarded the Newhaven Lifeboat to join the crew on their weekly training session. The skies were blue and the sea was calm making for the perfect sailing conditions. A couple of the Councillors were even given the opportunity to take the wheel and steer the lifeboat – just as well the seas were calm! The lifeboat sailed to the Eastbourne lighthouse where the boat stopped to allow for photos to be taken before turning back to Cuckmere Haven where the boat was anchored to carry out a training exercise. The trip lasted approximately 2 and a half hours and everyone was back on land by 12.30pm to enjoy a hot mug of tea!